On March 15, 2019, Hanoi National University of Education solemnly held a Doctorate Award Ceremony (2018), Closing Ceremony and awarding Master of Science degrees. According to the decisions of the President of Hanoi National University of Education, the total number of post-graduate students granted Master's and Doctorate degrees is more than 1,500, of which 93 are new Ph.Ds and 1,420 new masters at all specialized. Master and doctoral training has been a responsibility of Hanoi National University of Education. Recognizing the importance of training high human resources who will positively impact the development and social progress, each staff of the University always concern and dedicate to the training process as well as the services. Speaking at the awarding ceremony, Prof.Dr. 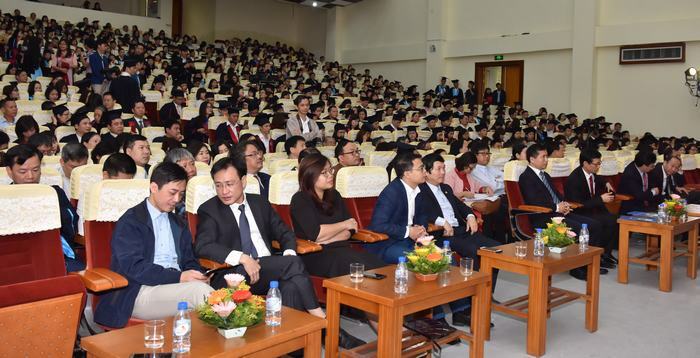 Nguyen Van Minh, President of the university, congratulated the new Ph.Ds and Masters for their efforts to overcome difficulties, successfully defended the thesis, dissertation and received a diploma. At the same time, the Principal Professor also sent many meaningful messages to the new Ph.Ds and Masters about the awakening "as a journey to approach, a chase without any end with desire for knowledge to renew themselves and be better for work ”, and the need to establish a "global reference system". Establishing a new way of thinking is also a way to establish working’s responsibility and practical action stemming from the concerns of intellectuals about the country and education. “I hope you will act smartly and responsibly ... Human civilization is the achievement of intelligence and kindness. Missing of the two elements is either unenlightened or sadistic. We are expecting a better society, intelligence accompanies and conquers the good. Let’s become the ones who use intelligence in the right place and meaningfully”. At the Ceremony, representatives of new Ph.Ds, Masters, and PhDs. Cao Xuan Phan - President of Bien Hoa High School for gifted students, Ha Nam Province - had represented more than 1,500 students to speak, to express his thoughts and feelings. The new Doctor had sent a deep gratitude to the teachers, the school officials, and also shared with the new PhDs and Masters: "the achievement we achieved today is not the final destination. but that is an important start for a new way ... Each of us must continue to strive more, bring all our physical and mental strength, and apply them flexibly and creatively the knowledge and experience we had learned in practicing work to affirm to society that the Doctors and Masters provided by Hanoi National University of Education to society are high quality human resources. High in character, high in knowledge, creative thinking, professional competence and above all, are deeply human values ​​”. Dr. Cao Xuan Phan also said that, only when doing so can it repay the great merits of the teachers and the school.